Online platforms continue to develop as places to purchase various types of products, including books, triggering the presence of new online bookstores and prompting established ones to join the bandwagon. The pioneer of it all was Amazon. The now e-commerce tiran started out as an online business that focused on selling books in 1994, a venture that spread to some 45 countries. To take it up a notch, Amazon released Kindle in 2007, one of the first e-readers ever commercialized that allowed readers to download e-books from the platform. The rise of online bookstores and e-books took the world by storm and Indonesia was no exception. Independent bookstore Afterhours, for instance, focuses most of its operations online. “Retail distribution takes up a major chunk of [our business],” Afterhours publisher and producer Lans Brahmantyo told The Jakarta Post on why it decided to focus on e-commerce. Ever since its establishment in 2005, Afterhours has published some 100 titles, focusing on culture, lifestyle, art and design. Their books come out “visually-appealing, luxuriously-designed, well-written and using premium materials”, which as Lans said, making cost-cutting crucial. Apart from cutting costs, he said an online business brought other benefits, such as providing customers a direct channel to interact with the business, thus, tighten up customer relationships. He said the online platform also allowed the bookstore to display its whole range of books to customers in the most effective way, simply through their mobile devices. However, for Lans, it is still necessary for Afterhours to have a physical store as a physical presence “promotes confidence and prompts a more immediate and emotional action to purchase [books]”. The trend has also been picked up by Indonesia’s largest bookstore Gramedia. Active online since 1996 by having an online catalog and selling non-book items, Gramedia only started to implement the e-commerce model to sell books in 2007. Currently, Gramedia is in full swing with over 60 thousand titles being sold both in its physical stores and online. “Gramedia.com is always aware of its many competitors, especially in today’s digital world where people buy different products online,” Gramedia.com senior communications executive Gisela Kanya, told the Post. 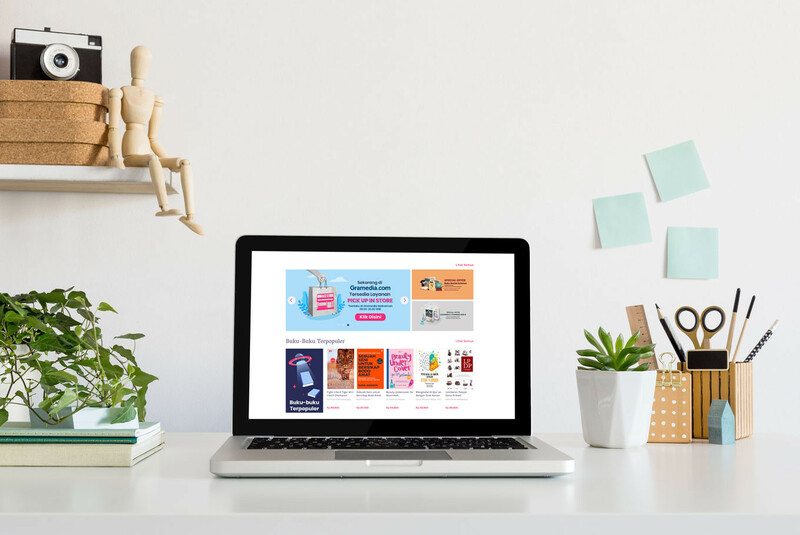 From then on, although the number of books sold on Gramedia’s online platform has not overshadowed those offered in the physical store, sales have continued to rise over the years, including at its online store. “Mainly since 2018, Gramedia.com can be reached via our app for mobile devices,” she said. Despite the rise of online bookstores, Gisela still believes in the significance of physical stores. She said that instead of choosing between online and offline platforms, Gramedia preferred to incorporate the two through what is called an omnichannel strategy. “Omnichannel means we use more than one channel [to sell products]. It means customers can order books online and pick them up at a physical store,” Gisela explained. She said it was also possible for the transaction to happen the other way around; if customers cannot find their desired books in a physical store, they are able to order and purchase them online and get the books delivered to their homes. Book enthusiast Aisyah Praya attributed the wider selection of books sold online than in real stores as one of her reasons to shop online. Furthermore, online bookstores also serve as a platform for a community of readers to gather, allowing customers to connect with one to another, she said. Aisyah has bought over 10 books online from various stores, such as Mode and Mode, Basheer and Periplus. From her experience, the books sold online are relatively cheaper compared to those sold in real stores. Despite her online preference, she said physical bookstores still needed to exist. — The writer is an intern at The Jakarta Post.